FREELANCE WRITER'S ANATOMY provides a routine for becoming a high-performance freelance writer. Strategy is key to researching, writing and editing articles, blogs, newsletters, web content, and book proposals. 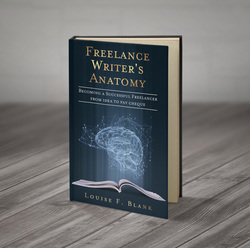 FREELANCE WRITER'S ANATOMY gets you off to a quick start and can improve your odds of success. All my shortcuts, sneaky little tricks, and motivational boosters that created my success are included. From idea to pay cheque, I leave nothing out. ​Louise's articles have appeared in major U.S. and Canadian magazines including Success, Canadian Living, Gardener for the Prairie, City Palate, Avenue, and Business in Calgary.